Baby Gem Boxwood is a dwarf form of the popular and hardy Japanese boxwood. It grows into a dense mound of green, with tiny leaves, and a naturally-dense habit. 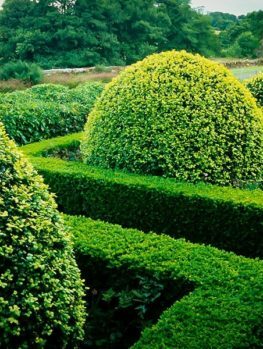 because it grows so tightly, it needs less clipping than other boxwoods – a wonderful way to have a neat garden but reduce the time you spent clipping. 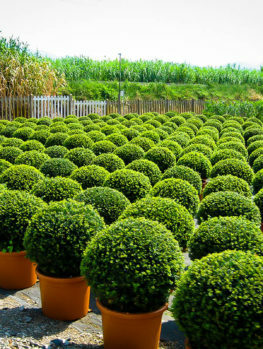 It can be used to make dwarf hedges anywhere between 1 and 3 feet tall, or it can be clipped into rounded or conical forms. With its natural dense growth and compact foliage, it makes a lovely evergreen for foundation planting without any clipping being needed at all – the look is softer and more natural. This hardy plant will grow in zone 4 without bronzing in winter, and is the ideal pick for anywhere you want a smaller, easy-to-care-for evergreen. Baby Gem Boxwood will grow in sun or partial shade, in any soil that is not always wet. It benefits from organic material in the soil at planting, and as a mulch over the roots, conserving water and protecting them. Because it is both faster-growing and dense, it will grow into a good-sized plant sooner, and need less frequent trimming to keep it neat and tidy. Keep it fertilized, and water during dry periods. Some simple care will reduce the risk of pests or diseases and keep your plants always healthy and looking good. Boxwoods are garden essentials, for smaller hedges, and as clipped specimens. 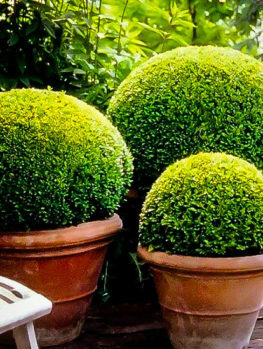 When it comes to choosing the right boxwood variety, it can be a tricky task. If you use a larger variety, it will grow quickly to the size you want, but need a lot of clipping to keep it that way. If you choose a smaller variety, it may take a very long time to reach the size you want. The Baby Gem Boxwood is the answer to that problem. It has very dense growth, so it always looks neat, and needs less clipping to keep it that way. 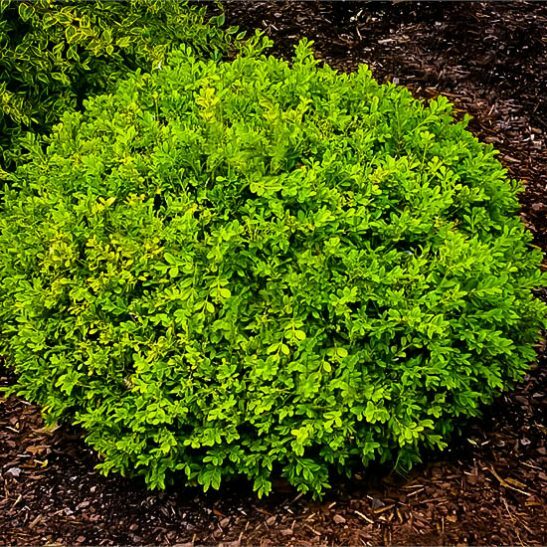 But it grows significantly faster than other dwarf boxwoods, so it reaches the size you want sooner. Nothing could be better! 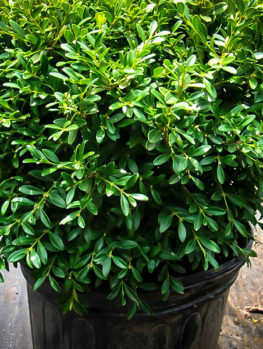 This unique plant is ideal for any situation where you want a smaller, very dense boxwood needed less-frequent clipping. Our stock will soon be depleted by knowledgeable gardeners, so order now while we can still satisfy your order. You won’t regret growing this exceptional plant. 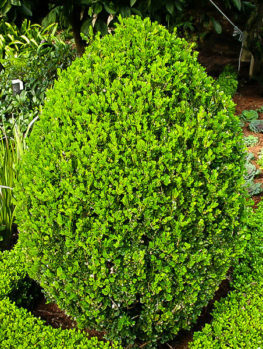 The Baby Gem Boxwood grows naturally into a rounded shrub about 4 feet tall, and the same or a little more across. Although most people clip their boxwood plants, they make lovely, more informal evergreens if left to grow naturally. That way you have less gardening work, and a more relaxed look to your garden. You can of course also clip them into a variety of forms, from balls to cones, and other simple geometric shapes. 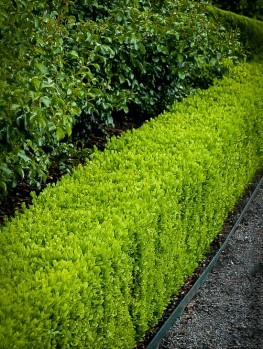 For hedges, plant the Baby Gem Boxwood in a row. For hedges under two feet tall, plant 9 or 12 inches apart, with the closer spacing for lower hedges. For a hedge up to 4 feet tall, plant 18 inches apart. 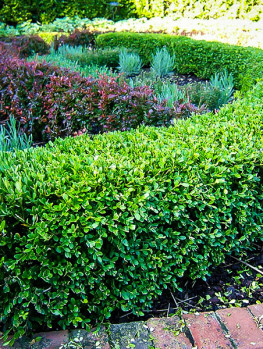 Clip two or three times a year, as the hedge develops, always leaving the upper part narrower than the lower part, to keep the foliage dense right to the ground. Once you reach the height you want, the beauty of this variety is that you will only need to clip once or twice a year, because the naturally dense growth will keep your hedge looking perfect much longer. The Baby Gem Boxwood will grow in full sun or partial shade. It is hardier than the English Boxwood, and it will grow well even in zone 4, with winter lows reaching minus 30 degrees Fahrenheit. It grows just as well all the way into zone 9, so wherever you garden, you can use this plant. It grows in most types of soil, if they are well-drained. Boxwood have shallow roots, so use a mulch over the root system to conserve moisture and prevent root damage from cultivation. Keep mulch a couple of inches away from the stems and don’t cover the lower foliage. In spring, feed your Baby Gem Boxwood with a hedge food – in a liquid form for young plant, and granular for older plants. Cover all the root area when feeding. 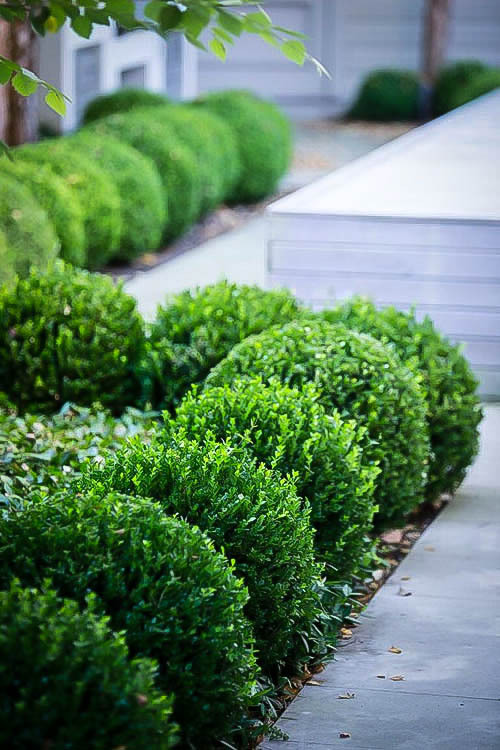 Boxwood can suffer from some pests or diseases, but plants that are fertilized and well-cared for are much less prone to them, and clipping plants regularly also removes some major pests. 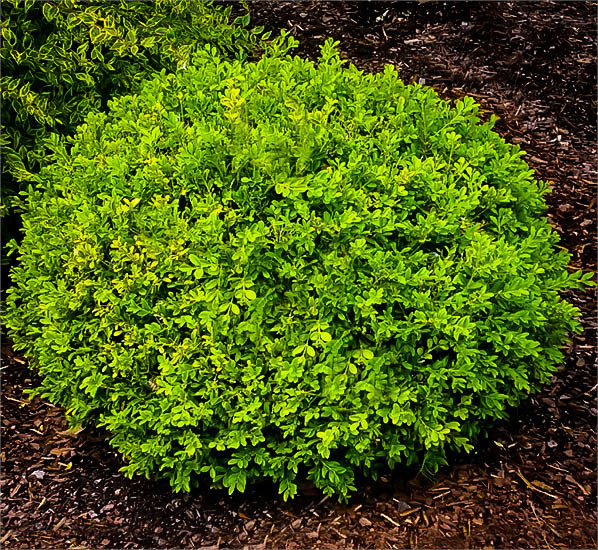 Deer normally leave boxwood completely alone, so that is one pest you won’t need to worry about. Allow new spring growth to develop before the first clip of the season. Do not clip before the average date of the last frost in your area, as this can expose the plants to cold damage. As well, don’t clip late in fall, as this can stimulate late new growth, that can be damaged in winter. The best clipping months are May, June and September. 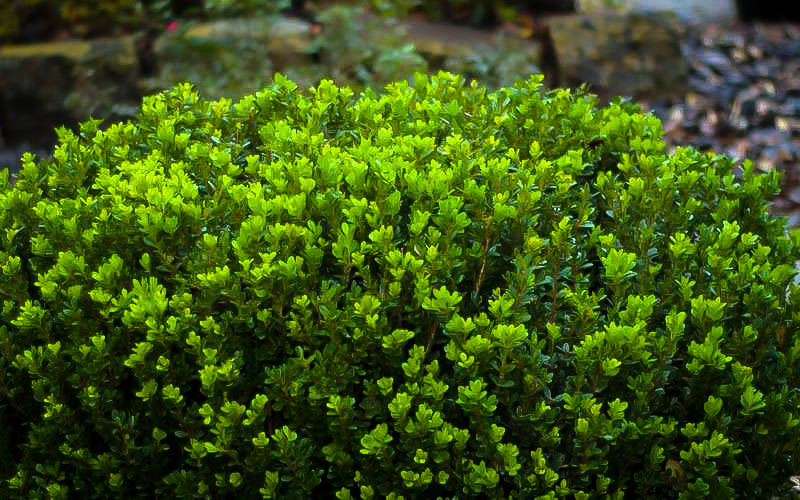 Japanese boxwood, Buxus microphylla var. japonica, grows wild in Japan and on the island of Taiwan. It is a hardy form of boxwood that is more suitable for American conditions than the English Boxwood. As well as staying green during cold weather more reliably, it has smaller leaves, and quickly develops a very dense look, with less clipping needed. There are many selected dwarf forms of this plant, and a popular older variety is called ‘Winter Gem’. In 2002 Rodrigo Moreno and Scott Maxwell were looking at some plants of that variety growing in a nursery in El Campo, Texas. They noticed a branch on one plant that had very small leaves and very dense growth. They took some cuttings and grew the rooted plants, and they found they remained small and dense. They realized how valuable this plant would be for gardeners, so they patented it and had it reproduced and distributed only by licensed growers. Our plants come from licensed specialist growers, and are guaranteed to be this very variety, with all its special qualities. Avoid cheaper plants simply called ‘Japanese boxwood’, which can be very variable and unpredictable in size and density.